Winners of the 2012 Haizetara International Street Band Competition, Oompah Brass are a multiple award-winning, critically-acclaimed brass ensemble. Oompah Brass are a classically trained brass quintet who met at the Royal College of Music. They started out in the German-themed clubs and pubs of London playing Bavarian oompah music. They soon began to find playing traditional waltzes and polkas rather dull, so they decided to arrange and play classic pop, soul and rock songs with an oompah beat and a Bavarian swing, thereby creating the first-ever Oom-pop! They now regularly support comedians live on-stage - for example, they recently played for Al Murray, Frank Skinner and Ross Noble during their respective London shows. 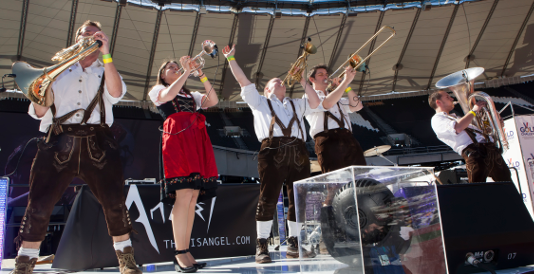 Oompah Brass perform in concerts and festivals all over the world. 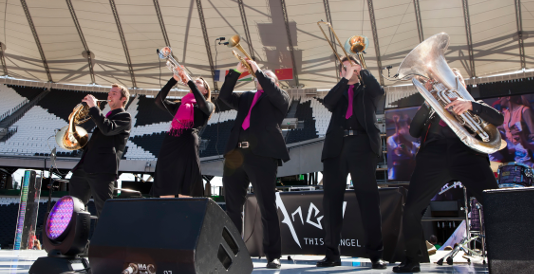 Last year, they won the prestigious Haizetara International Brass Festival in Spain, receiving the accolade of "Best Band in the Festival" and their French horn player, Sam Pearce, was also vot-ed "Best Musician in the Festival". They are often seen in cabaret at corporate events or playing winners onto the stage at awards ceremonies. They are very popular at weddings and birthday celebrations and have weekly residencies in London.